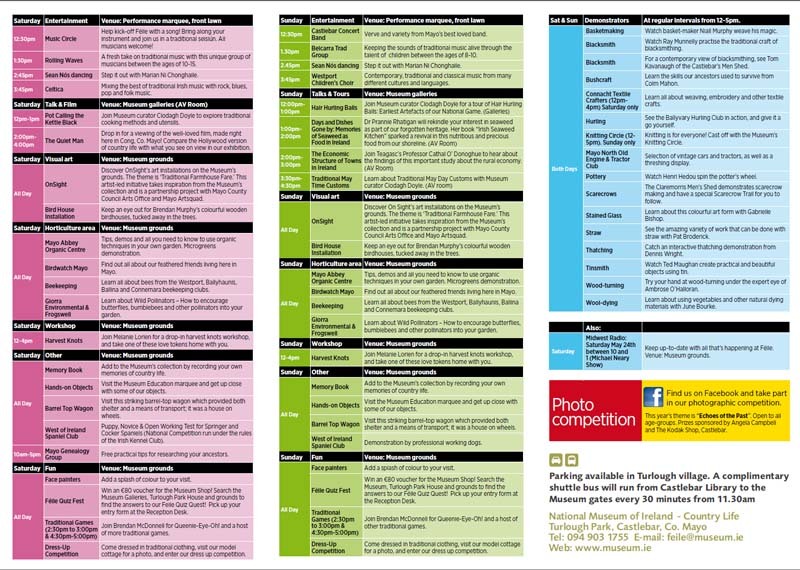 Next weekend (24/25 May) is Féile weekend at the National Museum of Ireland - Country Life. It's the much anticipated festival, Féile na Tuaithe, the celebration of the countryside and it's easier than ever to get there for everyone. A free shuttle bus service to Féile na Tuaithe will operate every 30 minutes from Castlebar Library to the Museum gates starting at 11.30am. Complimentary parking is available in Turlough Village for those who would like to bring their own cars. (Copies of the traffic management plan are available from the Museum and local shops in Turlough village). Midwest Radio kicks off the weekend in style with a live broadcast starting on Saturday at 10am, capturing the excitement of the build up and anticipation of the huge crowds. It's a great opportunity to hear about some of the new and different attractions - and help plan your Féile day. You might need come back on Sunday to make sure you see, hear and taste everything! This year more than ever, the Museum has pulled out all the stops to make Féile bigger and better than ever. The range of attractions, displays, demonstrations and stalls throughout the extensive grounds is really impressive and there are now more opportunities to meet and engage with the people who are making and creating. For music and dance, the birds and the bees, foodies and flowers, seaweed and strawcraft, traditional games and thatching - Féile is full of action and fun. The festival begins the moment visitors walk inside the Museum gates with attractions, displays, demonstrations and stalls throughout the extensive grounds. Féile really does have something to suit everyone from 3 to 93 and it's all completely free of charge. Music and art play a major part in Féile so keep your ears and eyes open as you meander through the festival. This year you can be part of Féile, not just an onlooker - raid the attic of your grandparent's house, dress up in traditional costume, send us a photo and you could win a gift voucher for the fabulous Museum Shop. It's free to enter and fun to do. To enter, just take a photo in front of the model thatched cottage in the Museum grounds and email it in. See Twitter and Facebook for entry details. The Museum and Galleries remain open during Féile and everyone is welcome to enjoy the folklife collection and take part in the fun Féile Quiz. Hail, rain or shine, there's something for everyone. 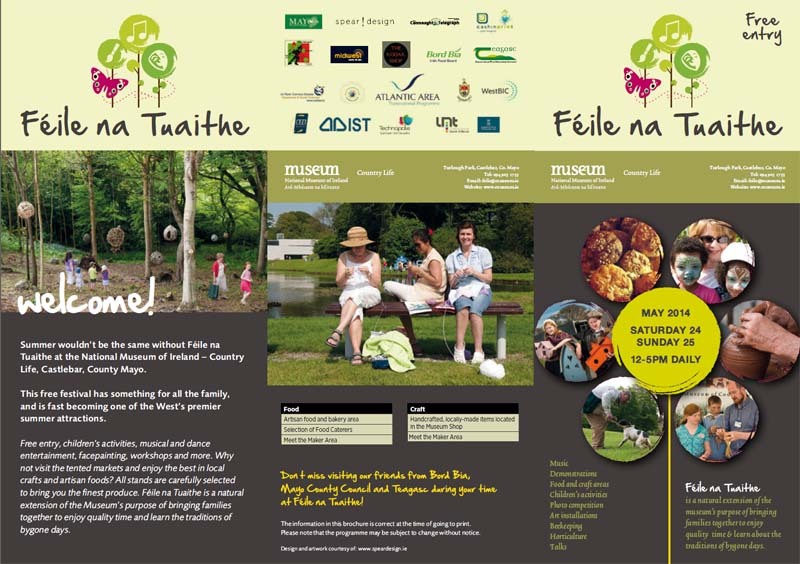 The West's biggest free family festival, Féile na Tuaithe, returns to the National Museum of Ireland - Country Life in Turlough Park, Castlebar, Co. Mayo on Saturday 24th and Sunday 25th May 2014. The festival is held in partnership with Mayo County Council and is expected to attract up to 20,000 visitors. All attractions, demonstrations and activities at Féile na Tuaithe are a joyful celebration of the countryside and have a direct connection with the Museum's theme. Starts at 12 noon each day.